As the leading organization in Cambodia to use technology for development, this last year the Open Institute continued its work of applying viable and sustainable technological solutions that promote change towards a more just Cambodian society. The Open Institute believes in the potential of these technological solutions to increase access to high quality education, information, and communication in both urban and rural communities, leading to advances in social development and gender equality. The largest program run by the Open Institute during this period is the USAID-funded SPICE program, which has given support to over 100 Cambodian NGOs on the use of technology to better reach out to their beneficiaries with information and services. The Interactive Voice Response (IVR) platform created by the program has hosted over 25 projects of NGO and government partners during this period alone. Together with Self-IVR, a voice technology for smartphones developed by Open Institute, the IVR platform has been recognized by USAID with the prestigious award of “Best Mobile Solution for Development in Asia.” The SPICE program has also supported the networking of young technologists through BarCamp events, while also promoting the use of Khmer script in mobile phones. The 10-year old KhmerOS program has continued its work on the standardization of the use of Khmer script in computers, and on the development and dissemination of open source software in the Khmer language. The Open Schools Program has completed integration of the Grade 11 ICT textbook in the education system and has advanced towards the development of a Grade 12 textbook, focusing on vocational orientation towards ICT careers. Open Schools is also helping the Ministry of Education use phone applications to support teacher training. A textbook on research methodology for universities has seen its final phase during this year and will be published during the next period. The Health program is developing technology to support the expansion of the computerization of the national health system through the use of tablets for patient registration and the monitoring of facilities. It is also developing innovative gamified applications to support the medical training of health staff. The Women’s Empowerment for Social Change program has worked during this period to support the development of policy and its application at the national and international levels. In particular, it has participated in the draft of the Second National Action Plan to End Violence Against Women, as well as in the 56 UN Session on the Convention to Eliminate All Forms of Discrimination Against Women (CEDAW). In both cases, the Open Institute advocated successfully for the inclusion of provisions in the final documents that define the need to explore the use of technology to prevent gender-based violence. The Open Institute has helped young people and commune council members improve their understanding and practice of democracy through the SPIDER-funded project Promoting Youth Engagement in Democracy Through the Use of ICT , promoting social dialogue and enabling access and sharing information. The UN Women-funded project Media Monitoring for Ending Violence Against Women has helped improve Cambodia’s capacity for monitoring and analyzing the way in which forms of violence against women are portrayed in print media, radio and television. 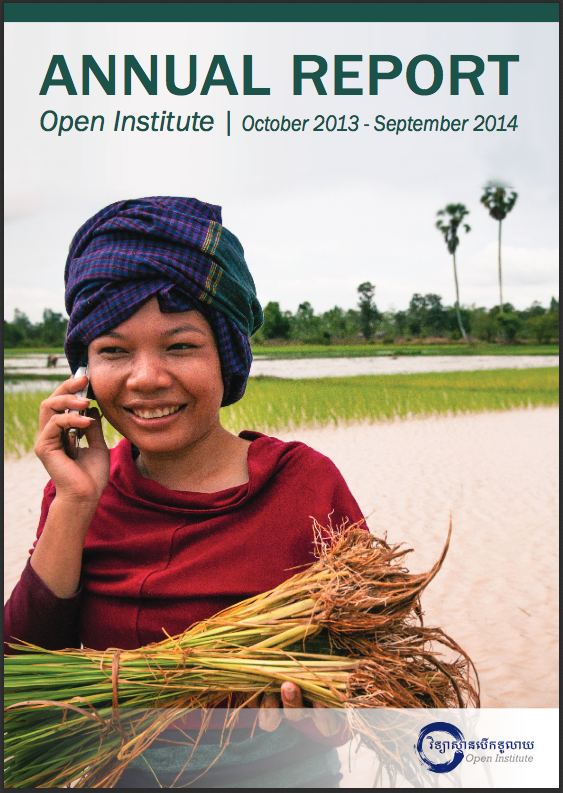 By coordinating the ICT4D Cambodia Network, Open Institute has helped enable relevant organizations to share knowledge, exchange experiences, and has promoted discussion regarding the use of different forms of technology. Through these programs and activities, Open Institute has succeeded in reaching its objectives by creating an awareness of the availability of new channels of communication that can be used to deliver services to the whole population of the country. It has also helped NGOs to use technology to maximize their impact and create a more just and developed Cambodia. You can also download by clicking Here.